After a couple years’ worth of flabbergasting player transactions that sent relatively young, increasingly talented, borderline world-class players from some of the best leagues in Europe and South America to the gilded shores of China, this season felt quieter, like maybe normalcy had finally reasserted its grip on reality. But then, just today, Atlético Madrid sold Yannick Carrasco and Nicolás Gaitán to Chinese Super League club Dalian Yifang, and everything is nuts all over again. The main reason why the gold-paved road from Europe to China—the one that brought star players like Oscar, Carlos Tévez, Hulk, Alexandre Pato, Ezequiel Lavezzi, and so on to the Far East—hasn’t seen as many travelers over the past couple transfer windows is due to the Super League’s efforts to, if not barricade the pathway entirely, then at least greatly limit its foot traffic. Out of fear that the young and growing league’s clubs might spend themselves into oblivion by overpaying under-motivated washouts from the European leagues, and in an effort to funnel more of Chinese soccer’s considerable wealth into developing more local talent, the Super League imposed a 100 percent tax on all foreign player transfers that exceeded about €5 million. Chinese clubs were already paying above market value in both transfer fees and contract terms to convince clubs to sell some of their best players and to ensure the players would come; by doubling those already outrages fees, the league hoped the financial costs would prove too burdensome for even the richest teams to splash the cash the way they had in years prior. For the most part, this strategy has proven a success. While it hasn’t stopped big-name players from heading to China entirely—it didn’t keep ex-Barcelona defender Javier Mascherano from joining Hebei China Fortune this winter, for example—the kinds of players making the move now tend to be older guys in the final stages of their playing careers rather than the prime-aged talents the league had been vacuuming up before. Today’s news violently upends that trend. Rumors have swirled for a couple weeks now about this happening, and Atleti made it official today: they’ve sold both 24-year-old Belgian winger Yannick Carrasco and 30-year-old Argentine winger Nicolás Gaitán to China’s Dalian Yifang. Gaitán isn’t all that different from the sorts of players we’ve seen sign for retirement leagues like the Super League or MLS; he was a very good player not that long ago before leaving Benfica for what then looked like a perfect move to Atlético, but he’s getting up there in age now and for whatever reason never fit in with manager Diego Simeone’s tactical demands. So it’s not crazy that Atleti would cut bait on him now and that he’d see a big payday in China as more favorable than taking a likely pay cut and trying to reestablish himself for some smaller club in Europe. Carrasco is different, though. His situation is closer to that of Oscar’s, and is shocking for the same reasons. It wasn’t that long ago when Carrasco was seen as one of the key cogs—alongside Antoine Griezmann and Koke and Saúl—in an Atlético roster that was arguably the brightest collection of young stars in all of Europe. He became a regular fixture in the Atleti lineup, and regularly wowed with his speed, dribbling, creativity, and eye for goal. Even though he’s apparently fallen out of favor this season (he’s made more La Liga appearances coming off the bench than as a starter), at just 24 years old, he still has a skillset and potential that every big club in Europe would love to have. Just last month, reports named Juventus and Arsenal as serious suitors looking to bring the versatile attacker to their clubs. Whether in Madrid or elsewhere, Carrasco looked destined for legitimate stardom. 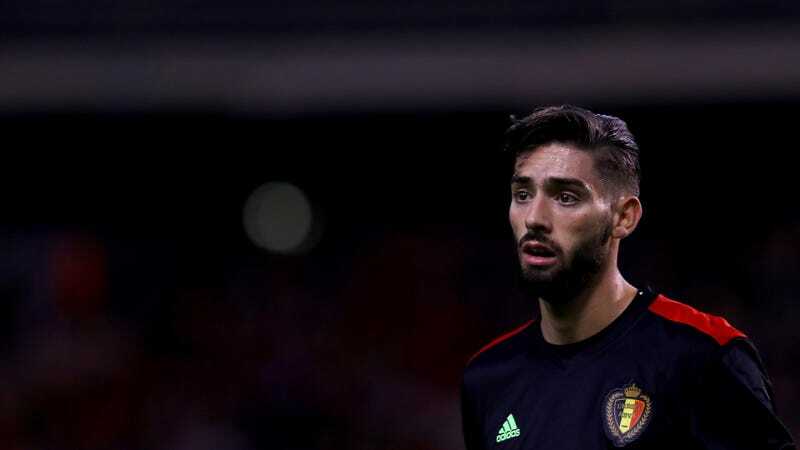 Instead of realizing his potential in Europe, Carrasco has traded his seemingly impending stardom to be rich, unchallenged, and anonymous in China. It’s an understandable decision, but a disappointing one nevertheless. According to some reports, Yifang will pay Carrasco a base salary of €10 million per year. For comparison’s sake, that’s about twice as much as his more talented compatriot, Romelu Lukaku, is getting paid by the richest club in the world, Manchester United. Suffice to say, Carrasco was never going to pull down money like that in any league in Europe. On Atleti’s side, the terms of the move are a little more confounding. In an ideal world, Atlético would’ve tried harder to integrate Carrasco into their starting lineup. But managers write off gifted but ill-fitting players all the time, so getting rid of a player like that is perfectly acceptable too—but only for the right price. Supposedly Yifang are paying Atleti €30 million, which is a bafflingly low amount in this era of ballooning transfer fees. With Arsenal, Juventus, and presumably a handful of other big-money suitors sniffing around Carrasco, you’d imagine Atlético could’ve commanded twice as much money for a player of his caliber and potential. It’s possible that the fact that Yifang were also willing to take Gaitán off Atlético’s hands made the club more willing to settle for a lower fee for the more valuable of the two. Atlético are also still struggling economically, and thus might’ve been willing to take whatever immediate cash they could get into their bank account. Also, Dalian Yifang are owned by Wanda Group. Wanda and Atleti have deep sponsorship ties goes back for years now, and the company’s main shareholder, Wang Jianlin, who was a part owner of Atlético until a couple weeks ago when he sold his shares in the club. There has to be some kind of greasing of the skids going on behind the scenes that made this transaction go off so smoothly. What this means for the future of the game isn’t so clear. Regardless of today’s announced transfers, the Super League’s tax has been effective at curtailing spending. We shouldn’t expect a steady stream of mega-deals like the ones from the past couple years to continue on in the near-term. Still, Yifang’s moves today do show that even exorbitant taxes won’t keep their clubs from stumping up the cash to bring in the best players yuan can buy. Whether any of this proves to be a positive or negative development in the broader soccer world is something we’ll have to wait to see. What is most definite, though, is that cash still rules everything around the game, that China has a whole hell of a lot of cash, and that they aren’t afraid to use it to go after the kinds of players they want, existing sporting hierarchy be damned. Correction: This post has been updated to reflect the fact that Wanda owner Wang Jianlin recently sold all his shares of Atlético Madrid and is no longer one of the club’s shareholders.